^ a b c White, James D. (April, 1974). 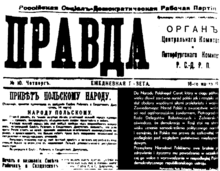 "The first Pravda and the Russian Marxist Tradition". Soviet Studies, Vol. 26, No. 2, pp. 181–204. Accessed 6 October 2012. ^ Bassow, Whitman. (February, 1954) "The Pre Revolutionary Pravda and Tsarist Censorship". American Slavic and East European Review. Vol. 13, No. 1, pp. 47–65. Accessed 6 October 2012. ^ Elwood, Carter Ralph. (June 1972) "Lenin and Pravda, 1912-1914". Slavic Review. Vol. 31, No. 2, pp. 355–380. Accessed 6 October 2012.